For many companies around the world and across industries, it’s no longer a question of whether to adopt cloud applications. Instead, it’s a question of which applications are best delivered as cloud services, and how to migrate to them from current on-premise systems. It can be daunting to consider a cloud migration, especially for core business applications such as financial management, human resources management, and payroll. IT leaders are looking for peers who have already made the transition from on-premise to cloud and can share the knowledge and best practices gained from those experiences. In a global study, CIO.com took an in-depth look at how midsized to enterprise-level companies in financial services, healthcare, insurance, manufacturing, professional services, retail, technology, transportation, and utilities have migrated to the cloud. 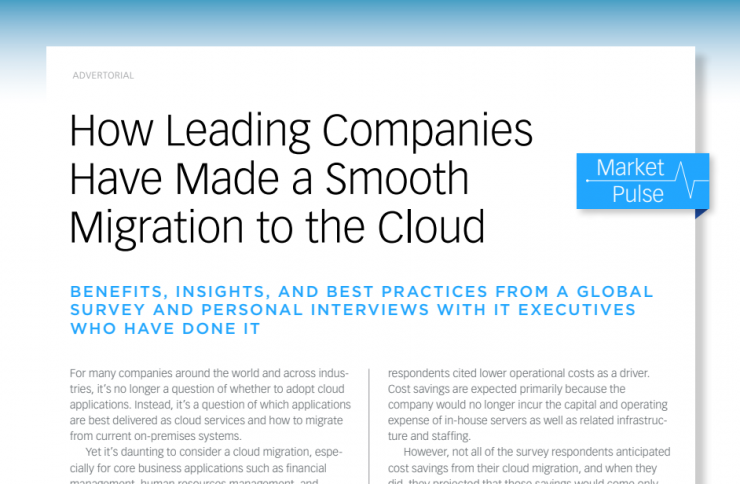 Through an online survey of nearly 450 IT leaders representing 17 countries, respondents shared benefits gained, practical steps for the migration, and best practices. See the insights and best practices in this global CIO.com survey today.